Bulls-eye. O' Neill's answer is the best yet for explaining a complex situation in simple terms. The term “subprime” is a red herring; it is used by the media to minimize what is really going on. The meltdown in financing extends across the entire range of mortgage-security products. No loan-type has been spared. The wholesale market for anything connected to mortgages is frozen and the details are being intentionally withheld from the public. Two years ago, more than 65 percent of all mortgages were converted into securities and sold off to Wall Street. No more. That scam unraveled in July when two Bear Stearns hedge funds blew up and their were no takers for billions of dollars of mortgage-backed junk. Since then, bankers and hedge fund managers have been scrambling to conceal the facts about what mortgage-backed securities (MBS) are really worth; nothing. The fear is that when the public finds out what is really going on, they'll draw the logical conclusion that the banking system is bankrupt, which it probably is. Just look at these eye-popping losses which appeared in Bloomberg News on April 1 The financial ship is listing, and the mainstream media is doing its best to keep the public in the dark. So for the last eight months, a simple matter of “price discovery” on publicly traded securities has been a nonstop game of hide-n-seek. That's no way to run a free market. The recent collapses of Bear Stearns and Carlye Capital are just the latest additions to this ongoing farce. Carlyle was a $22 billion hedge fund that couldn't scrape together a measly $400 billion to meet a margin call. Why? Every analyst who wrote on the topic noted that the fund was loaded up with high-quality Triple-A and GSE (Fannie Mae) bonds. So what were they offered for their MBS? That question was never answered because Fed chief Ben Bernanke rode to the rescue and created a new $200 billion auction facility and –Whoosh---Carlyle's mortgage-backed junk disappeared down a black hole. How convenient; another Fed bailout to hide the damning evidence that trillions of dollars of MBSs are utterly worthless and devouring the financial system from the inside. Bernanke's myriad auction facilities (four, so far) are ostensibly designed to remove these mortgage-backed stinkers from the banks' balance sheets so they can start lending again. But there's another reason, too. The Fed thinks they can simply put these MBSs in cold-storage for a while and then re-thaw them when the market bounces back. But the market for MBSs won't bounce back. This is biggest housing bust in US history and prices have a long way to go. Who is going to invest in mortgage-backed bonds when the underlying asset is losing value every day? Besides, as Paul O' Neill points out; one of the bottles contains poison and investors don't like poison. 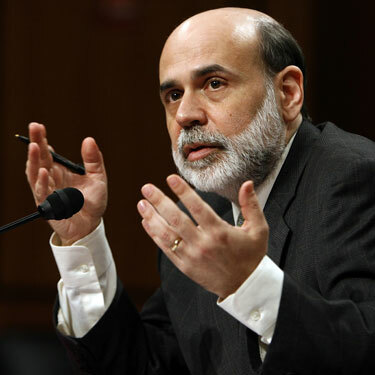 So, Bernanke is stuck trying to treat with the symptoms rather than the disease. As a scholar of the Great Depression, he's been rifling through his bag o' tricks to mitigate the damage, but without success. The rate-cuts and auction facilities have been a complete flop. The situation is worse now than it was in July; much worse. In fact, the develeraging of financial institutions is accelerating at a pace that no one expected threatening some of Wall Streets' biggest players and putting $500 trillion in counterparty agreements at risk. And it all began with eliminating the basic standards for issuing loans to credit-worthy applicants; the straw that broke the camel's back. Now the whole system is crumbling and an ominous sense of doom pervades trading floors across the planet. Everyone is just waiting for the next shoe drop. Pimco's Bill Gross said, “What we are seeing is the collapse of the modern day banking system”. American-style capitalism is in crisis-mode and the outcome is far from certain. The Fed's interventions show that the long held belief that markets are self-correcting has vanished. Laissez-faire is out; regulation is in. Bloomberg News summed it up like this:“It is no coincidence that the crisis of 2007 and 2008 had its origin in unregulated financial products traded in unregulated markets. Ever since the Great Depression, the government has tried to limit the leverage available to the public in the American stock market. But regulators, led by Alan Greenspan, the former chairman of the Federal Reserve, thought it would hamper innovation, and drive financial activity overseas, if there were any attempts to impose limits on leverage in the unregulated markets. Does the Fed realize that it is effectively monetizing the debt by issuing loans that may not be repaid or is this just a clever way to trick foreign investors into believing that the Fed won't print its way out of a crisis? The bottom line is, whether the nation is headed into a deflationary spiral or not; all of the Fed's tools are inflationary. Rate cuts, auction facilities or covert monetization all weaken the currency and levee an unfair tax on savers and people on fixed incomes. Unfortunately, these people have no voice in government, so we can't expect their interests to be fairly represented. Since housing peaked in 2005, 240 independently-owned mortgage lenders have filed for bankruptcy. Wholesale funding sources have dried up and foreclosures are on the rise. Now, more than 75 percent of mortgages are funded by Fannie Mae or Freddie Mac while another 10 percent are underwritten by FHA. The real estate industry has been nationalized; another knock-on effect of Greenspan's low interest monetary policy. Presently, the Fed and the Secretary of the Treasury, Henry Paulson, are pushing to expand Fannie's and Freddie's balance sheets so they can absorb bigger and riskier mortgages. This is lunacy. Fannie Mae is already perilously under-capitalized and, if it defaults, taxpayers will be on the hook for $2.2 trillion. That doesn't seem to bother Paulson who is determined to reflate the equity bubble so the profits keep rolling in to Wall Street's coffers. Still, even if the plan goes forward, it's unlikely that Paulson and Bernanke will be able to re-energize the real estate market or ignite another housing boom. Public attitudes have changed dramatically in the last few months. The myth that “housing prices never going down” has been dispelled and high levels of personal debt have forced many to reassess their spending priorities. The American consumer has never been so over-extended. According to Bloomberg: Consumers fell behind on car, credit-card and home-equity loans at the highest level in 15 years, another sign the U.S. economy is slowing, according to the American Bankers Association's quarterly survey. Payments at least 30 days past due increased across all eight categories of loans tracked during the fourth quarter, the Washington-based group said today in a statement. Late loans in the quarter climbed 21 basis points to 2.65 percent of all accounts in a consumer-loan index created by the group. The American consumer is tapped-out. What he needs is a raise, not another loan. Bush's $500 per person Stimulus Package will do nothing to reverse the effects of 30 years of anti-labor legislation and class-oriented monetary policy. Another indication that attitudes towards spending have changed, showed up in a survey conducted two weeks ago by USA Today/Gallup. The poll released showed that 76 percent of Americans believe that the country is now in recession and 59 percent think the US will slide into a depression that will last for several years. Despite the media's attempts to convince us that these are “the best of times”; the public knows otherwise. Their pessimism is expressing itself through curtailed spending. There's nothing the Fed can do to change the prevailing mood of the country. Working people are hurting. The spending spree is over. 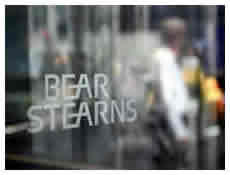 The Bear Stearns bailout is a prime example of the extent to which the Fed is willing to go to stop a meltdown. By approving the $30 billion dollar deal with JP Morgan, the Fed arbitrarily went beyond its mandate of providing liquidity to the markets and usurped Congress' authority to appropriate funds. It was a power-grab engineered under shaky pretenses. The Fed isn't authorized to prevent privately-owned businesses that are recklessly leveraged at 30 to 1 from defaulting. More importantly, the Federal Reserve is not Congress, although they have now assumed those constitutional duties. Speaker of the House Pelosi has said nothing so far. “President Bush was preparing to issue an executive order soon to expand the membership and reach of an interagency committee called the President's Working Group on Financial Markets. (aka; The Plunge Protection Team) The group was created after the stock market plummeted in 1987. The group is also expected to consider ways to broaden the authority of the Federal Reserve to lend money to nonbanks as needs arise. (Ed. note: To authorize more Bear Stearns type bailouts with consulting Congress).....Elements of the plan are clearly deregulatory. The plan proposes, for instance, to reduce the enforcement authority of the S.E.C. in a variety of ways and hand that authority instead to industry groups. The plan recommends that investment advisers no longer be directly regulated by the commission, but instead be supervised by an industry regulatory organization. Congress is being muscled out of financial market supervision by a troop of venal banksters and corporate picaroons who are threatening to finish-off the already-defanged SEC. That will put the Fed in the driver's seat for good. Paulson wants to police the world's most complex markets on the “honor system”. It's crazy. His blueprint is an obvious attempt to consolidate market-related functions under a central authority that is accountable to private industry alone. That way, the Fed can bailout whomever it chooses without congressional approval. Paulson's press conference was just a polite way of informing the American people that the seat of power has shifted from Washington to Wall Street. It's a banker's coup. So, where do we go from here? Pimco's Bill Gross gives us some indication in this recent quote: "In my opinion, the private credit markets have forfeited their privileged right to operate relatively autonomously because of incompetence, excessive greed, and in minor instances, fraudulent activities. As a result, the deflating private market's balance sheet is being re-nationalized in some cases with increased regulation, in others with outright guarantees and agency lending. Ultimately government programs which support private credit market assets may be required in order to prevent an asset deflation of significant proportions. Authorities must act quickly, with a shot of adrenalin straight to the heart of the problem: home prices. Since homes are the most highly levered and monetarily significant asset that American consumers own, if they decline much further they will drag the rest of the economy with them ." “Re-nationalized”; is that what it is? No one authorized the Fed or Paulson to re-nationalize anything. These over-leveraged banking behemoths need to fail. Let the market work. 28 million Americans are on food stamps, tent cities are sprouting up across the country, discretionary spending is down, food and energy prices are skyrocketing, and wages have been frozen for a generation. Where's the bailout for the working man? Instead, the government's largess is showered on a throng of unctuous fat-cat banksters so they can keep the larder on Martha's Vineyard topped off with Godiva truffles and Cuban cigars. Paulson has to go. Bernanke too. “ JUST before JP Morgan-Chase announced its initial $2-a-share deal to buy Bear Stearns, Ben Bernanke, the chairman of the Federal Reserve, held an extraordinary impromptu conference call. The participants on the Sunday night call, who got a preview of the deal, were Wall Street's biggest power brokers: Lloyd Blankfein of Goldman Sachs dialed in from home. John Mack of Morgan Stanley rushed to the office to listen on speakerphone. Richard Fuld of Lehmann Brothers, who had been directed to return home from a business trip in New Delhi by none other than Henry Paulson, the Treasury secretary, was patched in, too, among others. Typical of the Times, the reader is left feeling that the wild and destabilizing activities of one unregulated market participant, like Bear, is as natural as a spring rain. There's not the slightest hint that Bears' transgressions may have emerged from years of kicking down regulatory doors and feeding campaign contributions into a corrupt political system. That's way beyond the Times' range of analysis. Instead, the heroes of this financial kabuki are none other than the ashen-faced palatines at Fed and the Treasury who deftly donned their Haz-mat suits long enough to battle the flames of the banking inferno with a stream of taxpayer money. So much for moral hazard. If Bear had been properly policed; it would have been better capitalized with considerably less leverage. Its $2.5 trillion of derivatives contracts would have been regulated by government officials to make sure that they posed no threat to the broader system. Sorkin's recap just proves that the present stewards of the system are bunglers who are out of their depth. After years of serial bubble-making, they are finally begin to realize that their neoliberal Golden Calf was built on a foundation of pure quicksand. In fact, the sirens are already wailing as the yields on 3 month Treasuries continue to plummet, which is the bond market's way of perching itself atop the highest building in downtown Manhattan and screaming, “FIRE!” There's no telling when the stock market will get the message, but it shouldn't be too long. If Geithner's predictions of “a self-reinforcing downward spiral'' sound scary; so do the remedies. The Financial Times outlined the radical strategies that are now under consideration by the G-7 powers for dealing with challenges of the rapidly-expanding credit crisis. These include “the temporary suspension of capital requirements, taxpayer-funded recapitalisation of banks and outright public purchase of mortgage-backed securities.” Everything is on the table. “Emergency liquidity support”, reductions in capital requirements, concealing the true value of collateral, relaxing regulations, suspending accounting rules for assets; it sounds a lot like panic. These are the signs of a system so dilapidated that the pilings shake and the scaffolding wobbles with the slightest breeze. A system that's held together with the frayed strands of collective fear; bankers angst. Strike a match and the whole thing will go up like a Roman candle.